Please Post Any Inquiries you have by Commenting Below and I will answer in great Detail within 24 hours MAX- so that others may Benefit from the info. During Germination, & throughout their Seedling Stages, Temperatures MUST be between º33 and º65 Degrees (F) or º1-º18 Degrees (C). It can take up to 2 Weeks for germination. Make sure to follow our Tips in the Videos on how to Protect them from Birds & Slugs during those first few weeks. YES, they DO need LIGHT to Germinate and they HATE being Transplanted. Seeds take roughly 2 weeks to Sprout. Alternatively, you can plant half your seeds in the Fall, and half in the Spring, but if you get a lot of snow in your area, they’ll die. Poppies CAN be very easy to grow, and can also grow almost anywhere in the world, and require very little maintenance (once they get going). Generally speaking, growing poppies can be done almost anywhere. 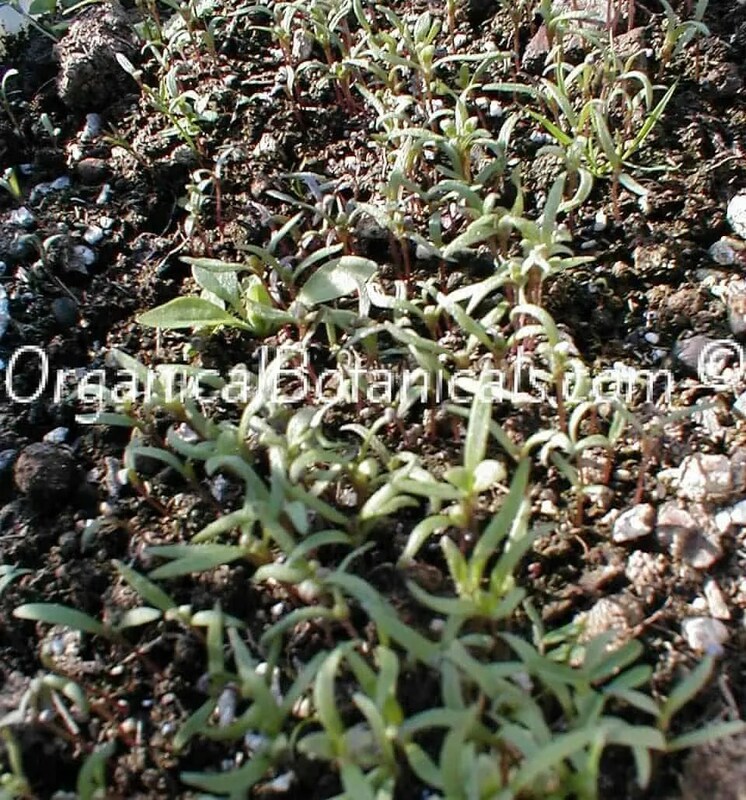 • HOW to plant, simply cast seeds on top of loose, moist soil. No need to bury them – but you can gently press them into the ground, or toss a very thin layer of soil on top. You can mix your Seeds with Sand to Spread them as you cast them, but SALT works best, as it retains Moisture, prevents clumping, AND deters Slugs from eating sprouts. • WHEN to plant will depend on which USDA Zone you are located in, but generally, seeds will sprout whenever Temps rise above Freezing (32, as Poppies prefer cool Temperatures during the Germination and Seedling stages. • WATERING: Just keep soil moist at all times during germination, but keep them Well-Ventilated (to avoid mold). Then, cut back as they mature to 2-4 x per week. • Results of Planting in Fall will provide earlier, and much larger blooms the following Spring, whereas Planting in Spring will still result in a spectacular display of Blooms, but just in early Summer. How Beautiful would it be….. I am using a tent for indoor advancement in the winter months so that I will have early beauty! Grow lights inside tent, so there is (after germination) a warm, humid climate inside the ‘tent’. It was a little slow going until I saw a tent and thought ‘aha”! I have build able plastic/wire shelving inside and a spray bottle at cabbage stage – bottom water ended up in the white mold stuff. Using water bottles with drilled holes for drainage of 8 – 10 inch in height. 1st mo. using peat growing tray was a waist, the germinated but the roots all were exposed app. 1 inch before leaves. Careful transplanting would have worked at this stage but I had so many in diff. containers at a healthy cabbage stage; I recycled the peat to build up mounds around. A TENT!! That’s a great Idea!! I wanna Move IN and Live inside. That would make a PERFECT Poppy Protector. Just be sure to ABSORB as MUCH moisture as you can. PLEASE HELP !!! I have grown several Strains of Poppy but EVERY grow, without Fail, the main Stem / New center leaf growth begins to turn a purpley / dark greenish and the tips curl under, and the main stem seems to “die” just before Bolting phase. I still get lots of Side Tillers but no main stem growth! Please, what am I doing wrong ? Not enough Light ? Too much light ? Not enough water ? too much water ? Nutrient Deficiency / Abundance ? thanks for your help ! I have never grown Indoor Poppies. Therefore, I cannot offer my true, honest advice. That’s why I talk about TEMPERATURE Ranges in this Tutorial, rather than the “Time of year”, etc (since we all live different places for us Outdoor growers). My best guess is their reaction has something to do with the fact they’re indoors. (hence my reasoning for not growing them indoors) because they’re Temperature to Light Ratio Plus Space Requirements, are just not worth it. Meaning, they need too much light, at VERY Cool Temps (which only LED Lights could solve, I would think). They hate to be crowded, and they like to be left alone. Plus I’ve never seen a Poppy do better, than planted directly in the Earth. So all these questions about Lights, and A/C units, are just gonna have to be things you learn on your own, but I am still glad to help whereever I can. But be sure to Document your Experience, and I’d be happy to have you as a Guest Post. I have all of my grows documented in a Journal by the day as well as Pictures, going back to my first naive attempt at a complicated Hydroponic systen which only resulted in Damping off. My current grow is in a tent with a 315watt Ceramic Metal Halide which puts out WAY more light in the right spectrum for growth, as well as they stay cool compared to other HID lights. I can maintain tent temps of 64-70 degree. So I wouldnt think Temp is an issue, but I dont know how they grow outdoors either. They are in 5 gallon Air Pots (holes in the sides for root growth) and those pots are spaced about 6 inches apart, one poppy each, so I would think they have enough space. Im just wondering if Im keeping the temps too cool around the bolting time and the mainstem dies for some reason or if I have a Nitrogen deficiency, Everything I have read on them says not too use much N as they will be mainly leaves and not produce large blooms if they have too much N. You said in one comment that they love N in all stages. Perhaps ill try that next. I was planning to gain experience growing and write a Poppy cultuvation Book from my notes etc. lol. Hi Nick, yes, most people don’t know this, but they DO prefer a Nitrogen Dominant Diet. 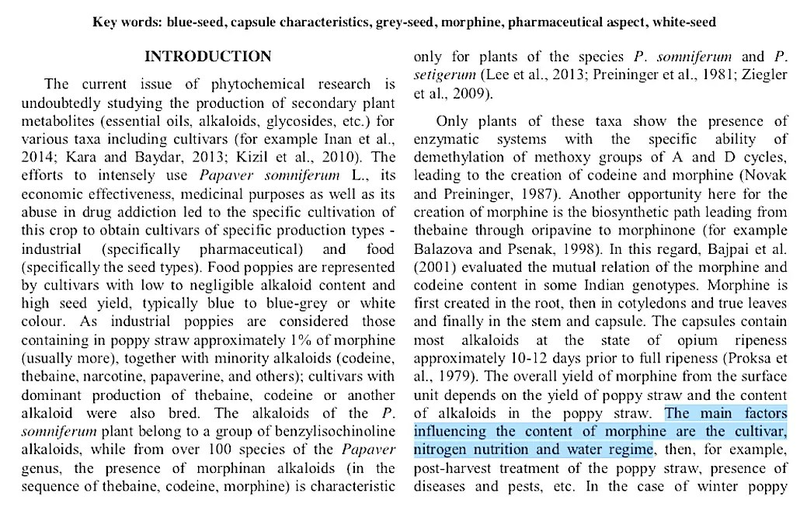 This was something I didn’t even know until a few years I started, but the Poppy is mainly a Green-Growth plant, and in one of the studies in our Blog (SEEN HERE) talks about the two Most important Factors that effect the Poppies outcome is it’s Cultivar, and Nitrogen Levels (see Screenshot). – 5 Gallons per plant would be the Minimum, but just know that Pots create a different dynamic when it comes to Watering & Soil Temperature (obviously, watering more often since it drains faster, and doesn’t retain Water & Temps like the Earth does). So, I would buy some Water Soluble Nitrogen (organically, I use ‘Down to Earth’ Blood Meal or Guano, then mix it with your water when watering them. That should give them a nice boost. AWESOME !! I am grateful for your knowledge, I also look forward to that guest post invite soon as I get my books in order. I just sowed your Lauren’s Grape, and I have about 13 of your strains as well and Im just cycling through them all. I added Chicken Manure and Blood Meal to the soils of these grows. We will see how that works out. Thanks Again ! I Look forward to someday getting up to Washington and visiting your Botanical Gardens, I think that would be amazing ! as long as you allow such. Cool. But I also advise AGAINST Manure, as it makes soild too thick. Be sure to read our other Tutorials. Hello, i would like to grow a 200,000 square feet area but it is only sand (the soil has about a foot or two of top soil).. should i put earth mixed with nitrogen in it? Because guano is illegal where i live since last year…with what should i enrich the soil? Last year I’ve tried without success, my land is in full sun (a field in the open) . I thought of digging and go to a center where they analyze your soil and make the mix you need, i thought of a 10-3-6 or something like that , do you think they’ll thrive in this environment? Thanks, been a fan since 5+ years. But only had results in Promix™ once…. So are you saying there is 1′ to 2′ Feet of Topsoil ABOVE the SAND? If so, you should be fine, as the Roots of a Matured Poppy Plant only penetrate about a foot at the MOST. And if there’s Sand below that, even better- since it will drain better. When casting Seed throughout a large area, you must find ways to protect the seeds for their 2-week long Germination period, where Birds have a special ability to destroy before they sprout (at first, they come looking for Worms whenever the Soil is disturbed- but Poppy seed Proteins and Fatty Acids are a Bonus). In large areas, you can use Flash Tape to scare them, but I’ve had a lot of success laying down Burlap (potato sack material). They sell it by the roll, 3′ feet wide. Which works perfect for a single Row. Then lay it flat over your Seeds. Which will not only protect them from birds, but also from being washed away. Burlap also helps to retain moisture during germination. The sprouts with then pop up between the threads. As far as Nitroen goes, there are plenty of other sources for Organic Nitrogen, such as Blood Meal (which is all Water Soluble Nitrogen). Mix your seeds with SALT while casting to spread them out (most people suggest SAND, but SALT offers additional function against slugs, and helps retain moisture). Last year i planted by spreading and putting some underneath ground (like 5mm maximum depth) but came out that grass grew over and nothing came out from the poppy seeds. .. should i put a membrane ? If yes should i put perlite+earth mix on top of a membrane? 2nd question, since im in open field with sunshine all day, the soil gets thirsty very fast more than once a day, is it a problem for the seeds (as it can get really hot during summer) or i just put water when i notice it dries? Because as of now temperatures are not possible since there’s snow outside (-5 degrees celceus ) but it’ll change fast like may is a temperature change for us here. The first time it worked (couple years ago) i planted them in june (around the 10th) and it gave mini pods around 25th July (but I didn’t buy my seeds here back then). But it wasn’t in the field…my aunt said she planted some back in the days in the field but she passed away so i can’t know how to maintain the field so it’ll go well.. thanks for everything you do. Hi Zen, actually, you can plant the seeds with snow still on the ground. In fact, they will germinate BETTER if you Cast your Seeds on Top of the Snow. Then, around the Base of each plant (or on top of the Burlap, if u can afford it), add a thin Layer of Perlite (about 1/4″-1/2″ inch). Since Perlite is White, it will not only reflect Light back onto the Plant, but will help Retain the Moisture in the Soil SIGNIFICANTLY – Especially with the Burlap & Salt (which also Protect Seeds from Birds, and Sprouts from Slugs). When Watering, you can also use Ice. 1,) Is it to late to try again? 2,) Should I wait till September? So basically we have a successful garden with no poppies, yet! I’d love any advise you can give, were currently in NJ, but plan to start our homestead in AZ in about 18 months. PS, I have some left over seeds in the freezer, hoping that the cold will allow germination in summer, pointless? Pss, I was about to order but I’ll probably wait to hear back first, . Feel free to send any good links, I find so much conflicted info. 2.) Yes. Or, if you’ll be planting them in AZ, I would definitely “Over-Winter” them by Planting in Fall. They will remain in a “Cabbage Stage” until after December 21st – then begin Flowering just as soon as Temps rise up enough to make them Bolt. At what point can my sprouts ‘handle’ being put into their permanent growing location? You should read through some of the 175+ User Questions I have answered among this Comment. There’s not a question that exists that hasn’t been answered about Growing Poppies. I watched all your videos and was wondering what kind of setup you suggest if I want to grow entirely inside? Lamp? Pots, etc? Ah yes, you must have missed the Comment Section where I have answered this Plenty of time to other Users, but I know there’s TONS of Comments. so I don’t blame you. My suggestion. USE LED’s ONLY since they are Cool enough and efficient enough to make it worth your while. Take photos. Document your experience, and share it with us – I’ll give you a Guest Post Spot of your own. That you can Moderate if u want. I purchased the Izmir Afghan GMO Somniferum Poppy Special Seeds. They were all white seeds which all germinated quickly. About half I planted grew and flowered quickly (60 days) with one pod per plant and very spaced out leaves, no real cabbage leaves at the bottom. These flowers looked like the ones in your pictures with fringed pink ends. The other half took about 3 weeks longer to bloom and had the distinct cabbage greens. They have multiple pods per plant and the flowers are a bit more light pink and do not have the fringed petal ends but are smooth. Just wondering if these are the same variety or possibly cross pollinated with a different variety. Since you grow them I thought I would ask your opinion on what may be going on. There are literally thousands of Variables that would cause this. As this happens often when growing poppies. 1st, just to clarify: ALL somniferum poppies have a “Cabbage Stage”, but can sometimes they can skip it, and go straight into the “Bolting stage”. Yep, this means they can go directly into flowering if one, of several Variables, cause them to believe that their “Purpose” is in jeopardy (Purpose: To Reproduce). Some of the Variables that can cause this are: Not enough/too much water, a late start, a Heat Wave, Transplanting, Over-Crowding, Not enough/too much Nutrients, Root disturbance, Packed Soil, Pests, etc. Basically, ANY so-called “Threat” to their Long Term Life Cycle can cause this. Now, I have no clue which of these it is, but hopefully, you’ll be able to solve this now. The ones that DID enjoy a Cabbage Stage, grew a big enough stem and root system to support more Blooms. The difference in the petals is nothing to be alarmed of. Look at ALL our Photos. We have plenty without the fringed edges. In fact, if you read the ORIGINAL DESCRIPTION FROM Izmir Farms (shown as a Screenshot in our Listing), you’ll notice them mentioning that some flowers are ALL WHITE!! (no pink). I know that’s not your case, but just so u know that flower petal variance is just nature. Please post some pics on our Facebook Page!! We’d love to see them! Hello I was wondering If you would be able to help with growing issues. I’ve read through the comments, so I’m just wondering any knowledge you could pass from outdoor growth. and they’re only little cabbages about an inch wide all together with 4~ leaves. and seem to be following the same way as earlier planted ones. I have them in sterlite containers and they’re spread apart about 6 inches. One isolated in a pot was to test if overcrowding was any sort of issue and it doesn’t seem to be the culprit either. However I am skeptical of my watering habits. I’ve tried every 3 days, every 4 days, and daily. Currently I’m doing every 3-4 days. With deep watering. Soil dries the next day halfway and the 2nd day is dry. The temperature stays at about 60-80 degrees. 70’s.~ for the most part. I think thats as much detail as I can think of. The growth however is very, very slow for conditions I feel or thought were almost perfect. But I don’t feel like I’m having any success growing. Any help you could think of would be immensely awesome. Sounds like a Temperature thing. It must be NO WARMER THAN 65 DEGREES (f) during its beginning stages, otherwise, they’ll never make it past that stage. Hello. Your GMO seed…is it possibly resistant to glyphosate (round up weed killer)? Also, if I carefully pick my petals off as soon as they show (for weddings), will this stop the plant from producing healthy pods for harvesting? I never tried killing them with roundup, but NO, I highly doubt they’d live. Pods will grow no matter what you do to it’s soft tissue outer layers (including petals), YES. Hi I’ve been germinating my seeds in peat pellets for a week or two and I’m noticing a white hair like fuzz appearing on the emerging sprouts where they meet the soil. I’m assuming this is mold? Could this be an initial root system trying to anchor the tap root? A few seem to have out grown the problem/fought it off, I’m just wondering if this is mold how dangerous is it to my seedlings? How often do you recommend watering peat pellets/how wet should I keep them during the initial germination period? What exactly do you mean by well ventilated, should I have a fan blowing over them? I’ve seen you mention using black gold soil conditioner for clay heavy soils but none of the stores around me seem to carry that specific product. I can’t seem to locate anything labeled “soil conditioner”. Is there a general ratio of peat moss, coco coir, earthworm castings, perlite, etc… you would recommend? I’ve added a cubic yard of both perlite and vermiculite and 2 cubic yards of black gold garden soil to a 25 square foot area. While the soil is now loose and not compacted there is a thin hard crust that forms on the surface after it rains. I’m worried that if I direct seed this area the crust will prevent the initial root penetration. NO, THAT IS NOT MOLD!!! Those are hairs that help anchor the seed to the soil. I have explained this in a previous Comment, but there are many, I know. The soil Conditioner is mostly Peat Moss and Worm castings. To be MIXED with tough, clay soil types in order to loosen up the clay. Perlite (which helps drainage) & Vermeculite (which does the opposite, by storing water- If that’s what u want), are mainly for POTTED plants. NOT for direct sowing (except for adding on the surface beneath the plant to help with mold). CRUST? Not sure what u mean, but what are you using to protect them from Birds/Slugs? As long as the seeds are in a crevice, hidden away within it, it should be ok.
– People always under-estimate birds. Thinking they won’t see the seeds. But they do see them. Birds watch us as we plant them. They inspect ANY Soil that has been moved, placed, or displaced. Many times, looking for worms. But are PROS at finding every last seed. – Or they see no slugs, and they move too slow to be a threat, but then wake up to missing sprouts. – If u started yours Indoors, remember to Acclimate them before planting outdoors.